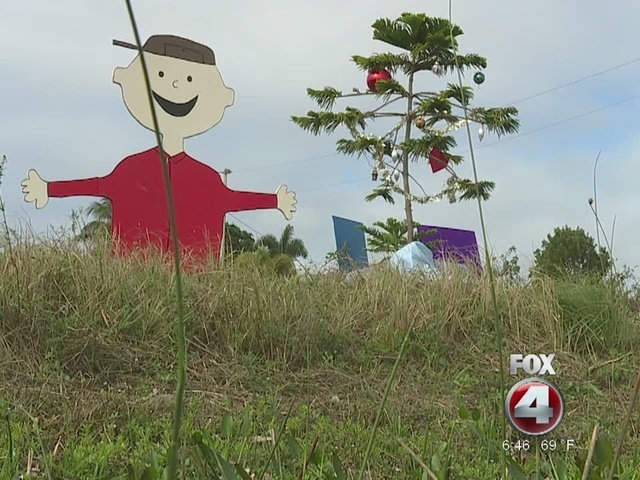 A decorative Christmas display is spreading more than holiday cheer this year, it's spreading hope. But the property owner where the display sits says he's not the one behind it. "I came out one day and saw and someone left a note and I didn't think much of it." Friendly Frankie owns the property where the display sits. He says he planted the tree 2 years ago. "It's bringing the Christmas spirit to people, and I'm glad to see that." Shortly after the display went up, people started leaving messages on the back of the wooden cutout of Charlie Brown. Tavia Allen, along with her daughter, wrote a note Thursday in honor of Tavia's father. "I actually had no idea that was even there. I saw the tree on Facebook, but I didn't know about the messages. And I love the messages, they are so inspiring." Messages of hope, love, and remembrance help those to heal. While Friendly Frankie doesn't know who put the display up, he's glad it's having a positive impact on people. "As far as I'm concerned, they can do it every year if they want," he said. The display is located at the corner of Burnt Store Road and NW 9th Street in Cape Coral.